With a truly simple design that does its job with ease, the Blomus ARA Toothbrush Holder is a practical piece for the modern bathroom. Designed in keeping with the rest of the ARA collection, this toothbrush holder is an understated yet useful piece for your bathroom which coordinates easily with many modern bathroom suites, accessories and décor. 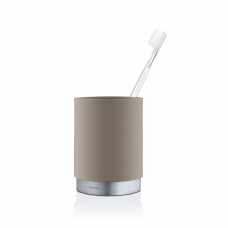 Constructed from stainless steel, one of Blomus’ key materials, the toothbrush holder has a matte stainless steel base and cup element, holding the toothbrushes, is made from quality polystone in a variety of colours. The colours and stainless steel contrast subtly to create a real contemporary feel and the distinctive Blomus branding logo is stamped into the metal base, providing a further touch of class. The holder measures 11cm in height with a diameter of 8.5cm and has a volume capacity of 300ml. The simple design and neutral colours allows the toothbrush holder to coordinate simply with other pieces in your bathroom and has a functional use which makes it a necessary piece in your room. If you would like to find out more about the brand behind this design and the wider range please visit our dedicated Blomus page.